Twenty mammary fat pads each from female Balb/c mice transplanted with TM6-HOG and fed with 0.1 ppm selenium and with 3 ppm selenium respectively, were evaluated at 4 and 12 weeks after transplantation for growth spread, proliferative index and caspase-3 activity. Thirteen mice transplanted with TM6-HOG in each selenium group were observed for tumor formation over 23 weeks. Tumors from mice in both groups were compared by cDNA array analysis and data were confirmed by reverse transcription–polymerase chain reaction. To determine the effect of MSC on the expression of the novel target gene and on cell migration, experiments were performed in triplicate. Se-methylselenocysteine (MSC) is a component of selenized brewer's yeast that has been successfully used to reduce overall cancer mortality by more than 40% in a human clinical intervention . Specifically, this selenized yeast was composed of selenomethionine (more than 85%), with components such as MSC, selenocystathione, selenocystine and other unidentified organic selenium compounds forming the remainder . MSC suppresses carcinogen-induced mammary carcinogenesis in rat model [3, 4], in which it enhances the fraction of p27Kip1-positive cells in mammary intraductal proliferations . In vitro, MSC is an effective growth inhibitor of mammary cells [6, 7]. We have shown in a synchronized TM6 mouse mammary tumor cell model that MSC inhibits DNA synthesis and total protein kinase C activity, causes S-phase arrest of these cells, reduces cyclin-dependent kinase 2 kinase activity, and induces growth-arrested DNA damage genes [7, 8]. In the same model system MSC also activated caspase-3 and induced apoptosis . More recently, we have documented the inhibition of phosphatidylinositol 3-kinase activity followed by dephosphorylation of Akt by MSC in mouse mammary cells in vitro . To identify potential targets of MSC in vivo, we used the cDNA array approach to compare gene expression profiles in the tumors arising from the mammary fat pads of mice fed on a diet high in selenium (3 ppm Se as MSC) with those in tumors from mice fed on the basal diet (0.1 ppm Se as MSC). The differentially expressed genes included prothymosin α, YB1 (Y box protein), the murine homologue of Drosophila single-minded gene (mSim), apolipoprotein E, and osteopontin (OPN). Prothymosin α is an accepted marker of tumor prognosis . YB1 is a key regulator for P-glycoprotein expression  and can predict drug resistance and patient outcome in breast cancer . mSim is expressed in the ventral diencephalon, branchial arches, and limbs, and its function might assist in finding the cause of Down syndrome . Apolipoprotein E has an important role in lipid metabolism by serving as a ligand to hepatic lipoprotein receptors . 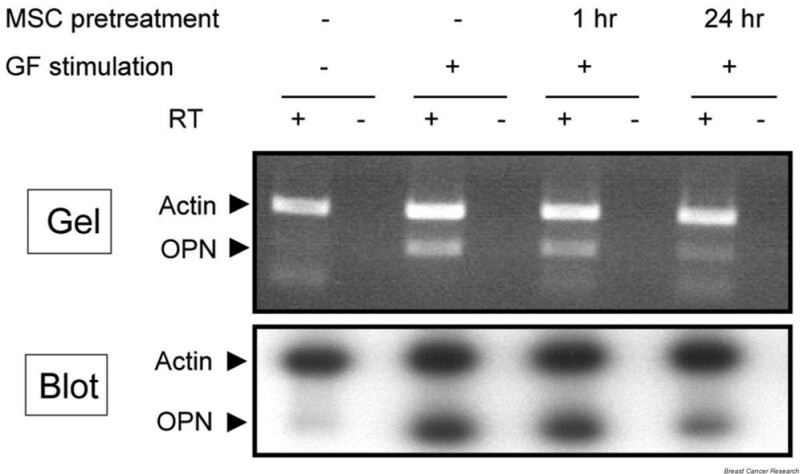 OPN is a secreted RGD (arginine–glycine–aspartic acid)-containing phosphoprotein that interacts with the αvβ3 integrin and is capable of promoting cell attachment, regulating intracellular Ca2+ levels, and influencing gene expression . OPN is expressed at higher levels in various transformed cell lines than in their non-tumorigenic cell counterparts . It has been associated with aggravated malignancy in breast cancer but its functional role in this context is poorly understood. In the present study we examined the efficacy of MSC against TM6 mouse hyperplastic outgrowth and the effect of MSC on the newly discovered in vivo target. Twenty female Balb/c mice (3 weeks of age) were transplanted with TM6 hyperplastic outgrowth (TM6-HOG) in both cleared inguinal (no. 4) mammary fat pads . Two weeks later, these mice were set up as two subgroups of 10 mice each and were fed on AIN-76A diet containing 0.1 ppm Se (nutritional level, basal diet) and 3 ppm Se in the form of MSC (CH3-Se-CH2-CH(NH2)-COOH; Sigma, St Louis, MO). Mammary fat pads were collected 4 and 12 weeks after transplantation, and the whole mounts were examined for TM6-HOG growth spread. In addition, the proliferative index of the fat pads was assessed and apoptosis was measured by caspase-3 activity. To assess TM6-induced tumor incidence, 26 female Balb/c mice were transplanted with TM6-HOG; 2 weeks later they were divided into two equal groups and fed on diets containing 0.1 and 3 ppm Se, respectively, as described above. The mice were palpated weekly for tumors for 23 weeks after transplantation. Some of these tumors were subjected to cDNA array analysis. Bromodeoxyuridine (BrdU; Sigma) was injected intraperitoneally into mice (70 mg per kg body weight) 2 hours before being killed at 4 and 12 weeks after transplantation. The mammary fat pads were harvested, flattened, fixed in 4% paraformaldehyde for 1 hour, and post-fixed in 70% ethanol. Paraffin-embedded tissues were cut (4–5 μm), then stained with hematoxylin–eosin for histology; sections were used for BrdU staining. The BrdU-labeling index for each group was determined  by immunohistochemistry with a cell proliferation kit (Amersham, Little Chalfont, UK). A total of 500 cells were counted for each mammary fat pad in each group and the proliferative index was calculated as the percentage of positive cells. A total of three fat pads were analyzed for each group at each time point. Mammary fat pads from each group of mice were homogenized in lysis buffer (10 mM Tris-HCl [pH 7.5], 200 mM NaCl, 1% Triton X-100, 1 mM oxidized glutathione, 5 mM EDTA) on ice for 30 min. Lysates were centrifuged at 10,000 rpm (9300 × g) for 10 min and the supernatant was used for the caspase-3 assay . Four mammary fat pads were pooled for each group of the Se-fed animals 4 and 12 weeks after transplantation, and this assay too was performed in triplicate. TM6 tumor tissues from mice fed with 0.1 or 3 ppm Se were compared for altered gene expressions after hybridization with individual membranes spotted with 1176 unique cDNA fragments (Atlas™ Mouse 1.2 Array; Clontech, Palo Alto, CA) as described previously . After densitometric analysis (Molecular Dynamics, Sunnyvale, CA) the signals were quantified and the values were normalized to ubiquitin (housekeeping gene) expression levels. TM6 cells were grown in 100 mm dishes for 48 hours in Dulbecco's modified Eagle's medium (DMEM)/F12 medium supplemented with insulin (5 μg/ml), epidermal growth factor (5 ng/ml), adult bovine serum (2%), and antibiotic–antimycotic solution (1×) at 37°C in the presence of 5% CO2 in air . The cells were starved for 24 hours in DMEM/F12 medium without growth factors and serum. The cells were then treated with MSC (100 μM) for 1 hour or 24 hours in serum-free condition, followed by 1 hour of stimulation with growth factors and serum. RNAs from these cells were isolated by using TRIzol (Life Technologies, Gaithersburg, MD) and reverse transcription–polymerase chain reaction (RT–PCR) was performed for OPN and β-actin as described below. Total RNAs from tumors of mice fed with 0.1 or 3 ppm Se diet, along with MSC-treated cells in vitro were isolated with the use of TRIzol. A 305 base pair PCR product for OPN was obtained with the forward primer 5'-CTT TCA CTC CAA TCG TCC CTA C-3' and the reverse primer 5'-GCT CTC TTT GGA ATG CTC AAG T-3'. To normalize the expression of OPN, a 568 base pair PCR product for β-actin was generated from the same reverse transcription with the forward primer 5'-GAG AAG ATC TGG CAC CAC ACC T-3' and the reverse primer 5'-CAG GAT TCC ATA CCC AAG AAG G-3'. The PCR was performed in a Perkin-Elmer 9600 thermocycler after denaturation (95°C for 1 min 45 s), 26 cycles of a three-step cycle (95°C for 15 s, 57°C for 30 s, and 72°C for 1 min 55 s), and extension at 72°C for 10 min. For hybridization, the OPN and β-actin PCR products were gel-purified with the Quiex II kit (Qiagen, Inc., Chatsworth, CA) and labeled with [α-32P]dCTP with the Prime-a-gene kit (Promega, Madison, WI). The PCR reactions were run on agarose gels, transferred to a nylon membrane, and then hybridized with OPN probe, washed, and exposed to Kodak MS film for 2 hours. The same blot was subsequently probed with β-actin, washed, and exposed to Kodak MS film for 2 hours. The blots were scanned in a densitometer (Molecular Dynamics) and the values for OPN were normalized to the corresponding β-actin levels. TM6 cells were grown for 48 hours in 100 mm Petri dishes in regular medium with growth factors and serum . The cells were starved for 24 hours in DMEM/F12 medium without growth factors or serum. The cells were then treated with MSC (100 μM) for 1 hour or 24 hours in serum-free condition. These pretreated cells were removed from each dish along with the untreated control cells, and 50,000 viable cells were transferred to 8 μm pore size transwell chambers (Costar, Cambridge, MA), in triplicate. The chambers had previously been coated with gelatin (6 mg/ml) on the inner side of the filters and rehydrated with 100 μl of DMEM/F12 medium. These chambers were placed in a 12-well plate. The cells were allowed to settle for 1 hour and the growth medium, along with serum and 100 μM MSC, was added to the wells on the outside of the transwell over a period of 10 hours. The culture medium was aspirated from the inside of the transwell and the filter was wiped clean with a cotton swab. The outer side of the membrane was fixed in 1% glutaraldehyde for 1 hour. After rinsing the glutaraldehyde solution, the filter was stained in hematoxylin for 10 min. Filters were subsequently washed in water and the blue color was enhanced in saturated lithium carbonate solution for 5 s. The cells migrating through the filter to the other side were examined microscopically under × 10 magnification and representative areas were counted. The number of cells was averaged from three readings for each treatment. All statistical analyses used SigmaPlot 8.0 software. Comparison of numerical data was achieved with a two-tailed unpaired t-test; P < 0.05 was considered significant. Measurement of the TM6 hyperplastic growth spread in whole mounts of mammary fat pads 4 weeks after transplantation revealed that there was no differential effect between the two groups of mice fed with 0.1 ppm Se and with 3 ppm Se (Table 1). However, by 12 weeks there was a significant decrease (P < 0.05) in the spread of TM6 growth in the 3 ppm Se group in comparison with the growth in mammary fat pads of mice fed on the basal diet. Growth in fat pad was measured as the length of spread between lymph nodes in millimeters; bromodeoxyuridine (BrdU) labeling index was expressed as the percentage cells positive; caspase-3 activity was determined as A405. Results are means ± SEM for three or four observations. Student's t-test was performed to compare values between the 3 ppm Se and 0.1 ppm Se groups for each parameter. aP < 0.05; bP < 0.0001. The BrdU labeling index, indicative of proliferation in cells, is directly related to the number of cells in S phase. We found that 4 weeks after transplantation the labeling was high; it then decreased by 12 weeks. There was no significant difference between the 0.1 and 3 ppm Se groups at either time point (Table 1). 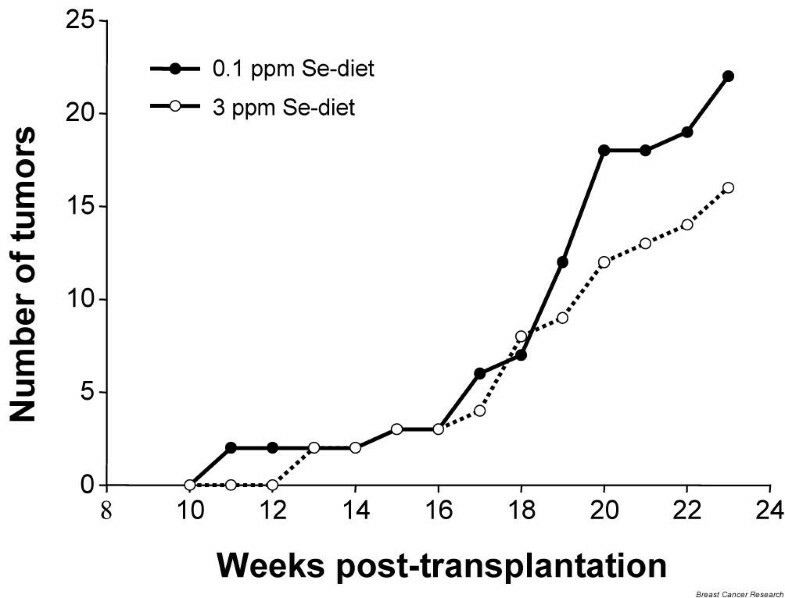 Furthermore, 12 weeks after transplantation, selenium-induced caspase-3 activity in the mammary fat pads of mice fed on 3 ppm Se diet was elevated more than sixfold in comparison with that in mice fed with 0.1 ppm Se (P < 0.0001) (Table 1). The first appearance of palpable tumors was delayed by 2 weeks in the 3 ppm Se group in comparison with mice fed on the 0.1 ppm Se diet (Fig. 1). Twenty-three weeks after transplantation, all female Balb/c mice fed on the 0.1 ppm Se diet developed mammary tumors, whereas only 77% of mice fed with 3 ppm Se produced tumors in the same period. The total number of tumors in mice in the 0.1 ppm Se group (22 of 26 fat pads) decreased to 16 of 26 fat pads in the 3 ppm Se group (P > 0.05). However, the average tumor size in the 3 ppm Se group (0.69 ± 0.19 cm2) was smaller than that in the 0.1 ppm Se group (0.93 ± 0.43 cm2). The cDNA array analysis of the tumors from both treatment groups revealed several differentially expressed genes. The mSim transcription factor was upregulated more than eightfold in the 3 ppm Se group compared with the 0.1 ppm Se group (B2h; Fig. 2a). Genes upregulated in the 0.1 ppm Se group included prothymosin α (B12f; 1.4-fold increase; Fig. 2a), apolipoprotein E (C2j; 1.45-fold increase; Fig. 2a), YB1 DNA-binding protein (B7i; 1.4-fold increase; Fig. 2a) and OPN (B13b; 14.3-fold increase; Fig. 2a). For the present study, we further analyzed the effects of MSC on OPN in vivo and in vitro. OPN expression in the TM6 tumor was elevated more than 14-fold compared with its level in TM6-HOG tissue (Fig. 2b, left panel). TM6 tumors in the 3 ppm Se group demonstrated a markedly decreased expression of OPN (Fig. 2b, right panel) vis-à-vis those in the 0.1 ppm Se group. 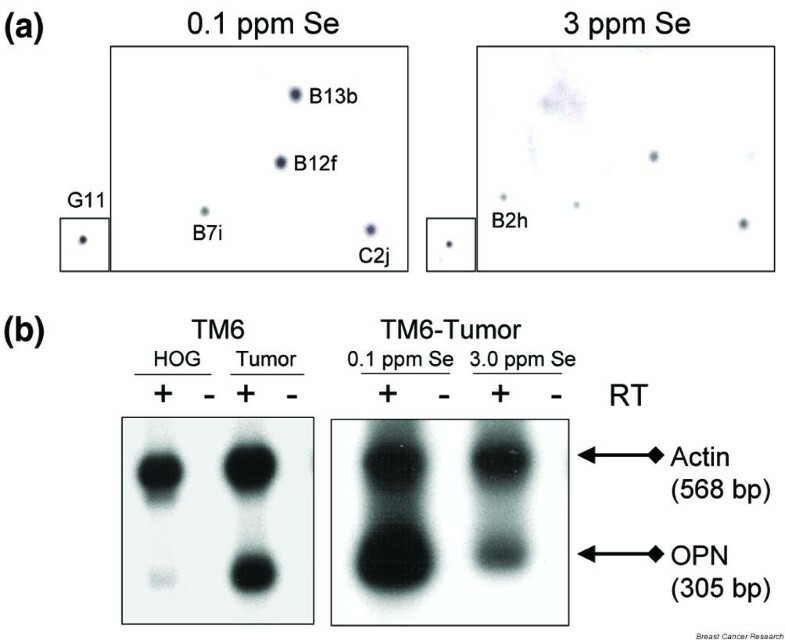 The average OPN expression in a set of three TM6 tumors in the 3 ppm Se group was 2.84 (± 0.17)-fold lower than that in the tumors from the control (0.1 ppm Se) group when normalized with β-actin expression. In view of the observation that OPN is related to cell spread and motility , we examined the effect of Se on OPN expression levels and cell invasion in vitro. After stimulation with growth factors and serum, OPN expression in the TM6 tumor cells growing in vitro increased more than ninefold compared with its level in the unstimulated TM6 cells (Fig. 3). A 24-hour treatment with 100 μM MSC followed by growth factor and serum stimulation downregulated OPN expression 4.4-fold compared with the OPN level in TM6 cells after 1 hour of stimulation with growth factor, as seen by RT–PCR bands and hybridized blots (Fig. 3). Pretreatment with 100 μM MSC for 24 hours significantly (P < 0.0001) inhibited TM6 cell migration in vitro compared with control untreated cells (Fig. 4). The earliest inhibition by MSC was observed after only 1 hour of pretreatment (P < 0.0001). MSC inhibits TM6 cell growth at the hyperplastic and tumor stages in the mouse mammary model. A significant decrease in growth spread of TM6 hyperplasia in mouse mammary fat pads at 12 weeks after transplantation might have been due to elevated caspase-3 activity in the 3 ppm Se group. However, this growth inhibition was not associated with decreased BrdU incorporation. The lack of suppression of proliferation is indicative of a possible delay of mammary tumorigenesis by pathways that might not involve cell growth inhibition as a primary response, as also suggested by another report . To our knowledge, the present study shows for the first time that selenium can activate caspase-3 in vivo. This finding is supported by other reports demonstrating apoptosis in mammary tumors in vivo [22, 23] as well as in the surrounding vasculature . Further work is needed to understand the mechanism(s) by which MSC induces cell death in pre-neoplastic lesions in vivo, particularly the crosstalk between the signaling molecules of the proliferative and apoptotic pathways. The first appearance of palpable tumors in the present study was delayed by 2 weeks in the 3 ppm Se group in comparison with mice fed on the 0.1 ppm Se diet. Furthermore, there was a 23% inhibition in tumor incidence in the 3 ppm Se group. These data are in agreement with previous studies [25, 26] showing that later stages of mouse mammary tumorigenesis (pre-neoplastic to neoplastic transformation of tumor growth) are not as sensitive to selenium-mediated inhibition as the early stages (expression of mammary pre-neoplastic lesions). The degree of inhibition in tumor formation by MSC in our mouse model was modest compared with that demonstrated in chemical carcinogen-induced rat mammary tumor models [3, 4]. This difference might be related to MSC-mediated inhibition at initiation (carcinogen metabolism and DNA adduct formation) and promotion (proliferation and apoptosis) stages and/or the species of animals examined. The mammary tumors in the 3 ppm Se group were smaller than those of the 0.1 ppm Se group, and the comparative cDNA array analysis of these tumors revealed several differentially expressed genes. To our knowledge, this is the first report of OPN expression being downregulated by any selenium compound. In the present study, the TM6-HOG tissue was compared with that of the TM6 tumor for OPN expression, which was elevated more than 14-fold. This difference could not be attributed to tissue heterogeneity in the TM6 outgrowth, because mammary epithelial cells comprise the vast majority of the source of RNA (more than 60%). OPN is expressed at higher levels in various transformed cell lines than in their non-tumorigenic cell counterparts . It has been associated with greater malignancy in breast cancer but its functional role in this process is poorly understood. OPN transcripts can be detected in both invasive and in situ carcinoma components of human breast cancer. However, the transcripts are not detected in surrounding stromal cells or in peritumoral macrophages . The fact that treatment with 3 ppm Se in the form of MSC decreases OPN expression in vivo might be contributing to the smaller size of tumors observed in our study. The contribution that OPN makes to the development of malignancy remains obscure. Possibly OPN promotes the development of a malignancy by stimulating cellular signal transduction pathways through the αvβ3 integrin . Further experimentation will be required to determine whether the inhibition of mammary tumors by selenium involves this integrin. An earlier report suggested that the ability to produce OPN does indeed contribute to the metastatic potential of cells . We have also observed that the OPN expression in a TM40D mouse mammary model that has the potential to form metastasis is significantly lowered by a 3 ppm Se diet (Emmanual Unni, Frances S Kittrell and Raghu Sinha, unpublished data). Both the toxicity and the chemopreventive efficacy of a selenium compound are mainly expressed as a function of its dose and the chemical form . MSC is a stable selenoamino acid that is capable of generating methylselenol endogenously through the action of β-lyase or related lyases . Because the cells in culture have low levels of β-lyase, leading to inefficient conversion of MSC to methylselenol [32, 33], we used a higher dose (100 μM) of MSC for the cell migration experiment. In cell culture experiments, doses of 50–100 μM MSC have been shown to inhibit mouse mammary epithelial tumor cell growth effectively [4, 8]. Our data demonstrating a decline of OPN expression after 24 hours of treatment with MSC is suggestive of a role for selenium in the attachment and migration of TM6 cells in vitro. Future experiments will examine a range of MSC concentrations, including the physiological dose of 5 μM. Considerable evidence indicates that αvβ3 integrin is important in cell motility and can mediate attachment to various adhesive substrates . We have shown earlier that selenium alters the gene expression of integrin-β and laminin receptor-1 in TM6 cells . To elucidate whether selenium is important in αvβ3 integrin-mediated migration inhibitions of TM6 cells will need further experimentation. In summary, these studies show that MSC can affect TM6 cell growth at the preneoplastic and malignant growth stages. One mediator is a lower expression of OPN and the other is activated caspase-3. Further experimentation is required to define the role of OPN in the inhibition of mammary tumorigenesis by selenium. We have analyzed OPN expression in TM6 tumors of mice fed on a 0.1 or 3 ppm Se diet. Lowered levels of OPN in tumors of mice fed with high selenium in their diet suggest that this gene might have a role in the selenium-induced inhibition of mammary growth. Similarly, lowered OPN expression and decreased migration of TM6 tumor cells after treatment with MSC indicate a possible role of OPN in selenium-induced inhibition in vitro. Furthermore, caspase-3 activation in fat pads of mice fed on a high selenium diet might contribute to the decreased growth spread in the mammary. We thank Daniel Medina, Professor of Cellular and Molecular Biology, Baylor College of Medicine, Houston, TX, and Karam El-Bayoumy, Institute for Cancer Prevention, Valhalla, NY, for review of this manuscript. We also thank Ilse Hoffman for editing the manuscript. A US Army Medical Research and Materiel Command Breast Cancer Research Grant (DAMD17-1-99-9076) to RS supported this work.